IN PREVIOUS columns, we�ve discussed what to do if you�re in a slump. If nothing�s going right, it can be a tremendous challenge to snap a cold streak; you often have to check a number of different areas of your game, including physical fundamentals and your mental game as a whole. ,br> This month, I�d like to address something that, while it can be frustrating, shouldn�t pose as many problems: How you do shake off the rust when it has been awhile since you�ve last played? ,br> First of all, it�s important to keep your perspective. If you haven�t touched a cue in six months, you�re not going to be running racks like you just got back from Manila. Expect a bit of a rough start, but keep focused on your fundamentals. Depending on your experience level, there should be some muscle memory as you get more and more familiar with your stroke. In recovering your form, it�s also important to work incrementally. Just like you�re not going to run racks out of the gate, you�re also not going to be drilling table-length cut shots left and right. Work on short, straight stop shots, like the example on the 1 ball in Diagram 1. Once you can successfully pocket the ball and stop the cue ball at the moment of impact, add distance until your cue ball is all the way against the bottom rail. If you can consistently hit this shot and kill the cue ball, you should start to feel in stroke. Next, move to a short angled shot, like the example on the 3 ball. Now you want to drill cue ball control, by working on stun, follow and draw. 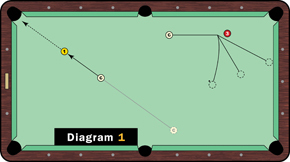 Try to sink the 3 using stun to send the cue ball along a 90-degree angle, like the middle target in the diagram. Then start working slight draw and follow. The first drill will help you get everything in line. The second shot will help you reconnect wit hthe cue ball. After a short time, you should feel on your way back to your old self.